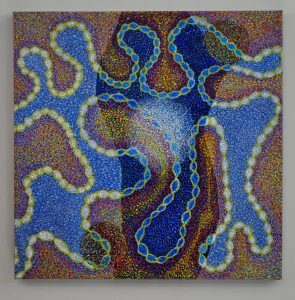 A viewer may see in Diane Lorio’s paintings several layers of dots or dashes or shapes. She builds upon each, over and over, to make a piece robust. She can work quickly, but she always likes to go back. She speaks of one body made of countless individual cells, of water as the sum of its molecules. Everything, to her, is part of a whole. Lorio, 66, recently returned to painting after many years supporting others in the arts. 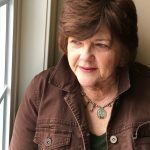 She created an award-winning high school art program; raised a musician daughter; supported the endeavors of her husband, the sculptor and 2013 Division fellowship recipient George Lorio; was the director of art education at a state-sponsored organization; and, most recently, she worked at VSA Delaware with developmentally challenged individuals by kindling their artistic talents. The current body of Lorio’s work is pattern-oriented and non-representational in content. 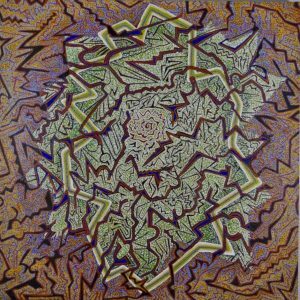 The patterning in her art, she says, reflects her interests in tribal cultures, the natural world and science. Lorio’s artistic journey began soon after she began taking an art class at her high school in Jacksonville, Fla., and went alone to the Museum of Modern Art while visiting her grandmother in Brooklyn at 16. She didn’t immediately grasp the intricacies of what she saw that day, but she noticed all that she liked within each painting. After that art class, she thought, maybe I can do something. “I wasn’t good at everything,” Lorio says. “I wasn’t a great mathematician or great at science. So what I did was I just started getting canvases and painting. When I was young, I just painted whatever I saw in front of me. I’d kind of look at it and emulate it. Years passed before she gained true confidence in her self-identification as an artist. Years, but still fewer than often is the case. Lorio, who moved to Dover six years ago from Brownsville, Tex., certainly has owned the label. The daughter of a handy father, she always has been technically inclined. She can sculpt, draw, work with film and fiber, to name a few. She considers herself an artist before she considers herself a painter, although she’s a painter more often than any other kind of artist. 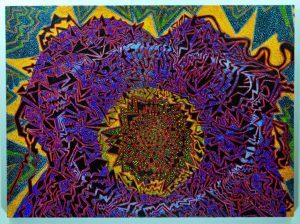 Lorio was painting in an abstract expressionist style until she noticed the patterns in quilts that an old crafts woman was making. The Division’s grant will help Lorio invest in supplies and equipment for her studio. She will focus on making new works as well as matting, framing and crating existing pieces for future shows.